One of the major trends this year is the way artificial intelligence and machine learning are revolutionizing the way organisations interact with their data. Businesses are evolving from using static reports to proactive analytics using interactive dashboards. These analytics are providing completely new insights for the organisations that use them. This data discovery has traditionally either been at a simplistic level or the domain of experts with the skills to process and understand advanced analytics. Management would then either have only a basic understanding of data trends or have to request detailed analysis from an IT expert. The result would typically be a static report that took time to compile and had reduced relevance due to the time it took. With the ongoing advancement of BI, everyday business people now have the opportunity to easily and quickly access real-time analytics. One of the quickest ways to experience this type of data discovery is by using a feature in Microsoft Power BI service called Quick insights. Quick insights are designed to quickly search a dataset and apply a set of sophisticated algorithms to discover useful insights. These insights may correlate data in a way that the user has not previously considered, allowing them to find trends or correlations that would otherwise have gone unnoticed.Take for example a manufacturer who is analysing sales data for the year and notices that there is an increase in sales for the month. With Insights they have the option to ask Power BI to analyse the information. The image below shows how an existing Power BI service visualization can be analysed by simply right-clicking the visualization and selecting Analyse. The resulting analysis shows that there was a 55.32% increase in sales between quarters 3 and 4. The key insight will be that the majority of the increase came from just 3 product categories as shown in the results below. This example was initiated by the user through an existing dashboard visualization. 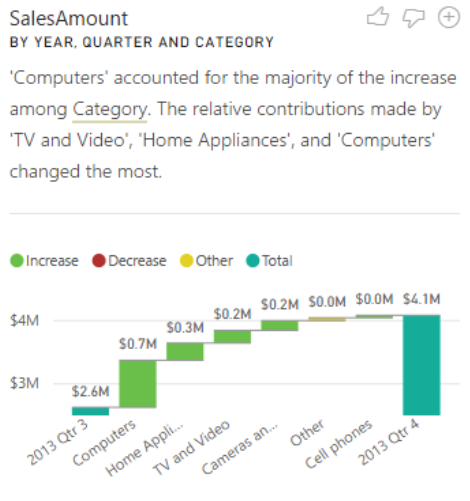 Power BI can also be used to scan a whole dataset to look for what it sees are significant trends or correlations. 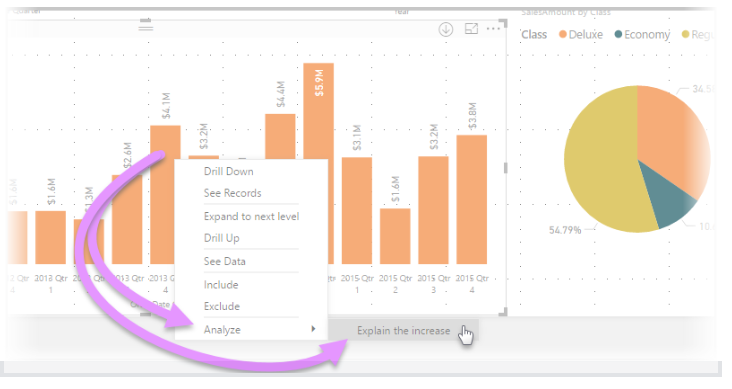 To do this in the Power BI service, a user needs only click on a dataset, and select “Quick Insights”. Once selected, the service will display a dialog “Searching for Insights” while it scans the data and builds the visualizations. Below is an example of some quick insights run against a dataset containing manufacturing data relating to the quality of materials supplied. 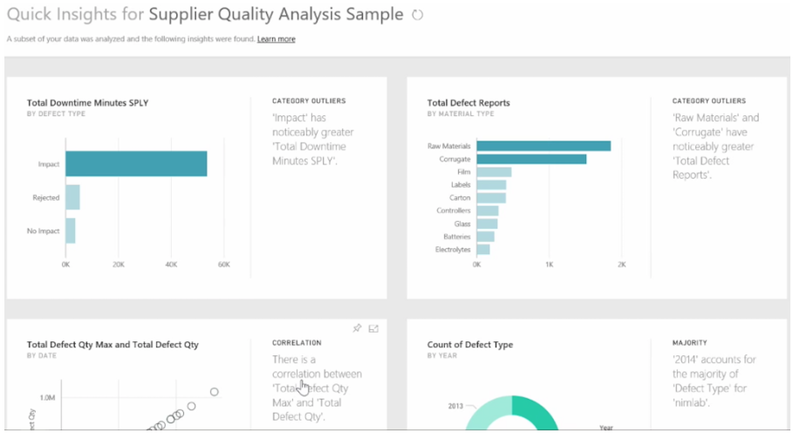 If you look at the visualization on the top right, you will see that the Power BI service has highlighted that there are two materials that are reporting greater manufacturing defects than other materials. This is quite significant when you consider that the Power BI service has no actual understanding of the business, the way it functions or what problems it is looking to solve. In effect Quick Insights may find problems that businesses didn’t even know they had and then provide the tools to further understand the issues uncovered. It will be interesting to see how smart these Quick Insights end up being when end users, particularly those with limited resources who typically don’t have full time data scientists working for them, start to use them to interrogate their data. Artificial Intelligence and Machine Learning are making it possible to work in new ways and for substantially less cost than the previous generations of technology. To learn how PowerBI can be integrated into your business, please get in touch. Peter Cummins has many years’ experience with business intelligence technologies in manufacturing and distribution environments.